Dr. R. Christopher Bailey has lived in the High Point area of North Carolina since 1972. He attended The University of North Carolina at Greensboro where he received his bachelors degree in Biology in 1991. He then received his Doctor of Chiropractic degree from Logan College of Chiropractic in St. Louis, Missouri in late 1995. Dr. Bailey's internship was done in two of the Logan College clinics in Chesterfield and St. Charles, Missouri during 1994 and 1995. 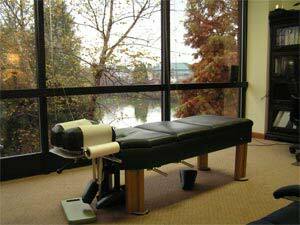 Bailey Chiropractic Centre is centrally located in the Triad of North Carolina. While our address is High Point, NC, we are on the north end of town with Greensboro just to our east and Winston-Salem just to our west. Right off Hwy 68 (Eastchester Dr.) between Interstate 40 and Hwy 311 on Penny road. Our central location is quite convenient to most everywhere in the triad and surrounding areas. Our office is convenient to: Kernersville, Colfax, Oak Ridge, Stokesdale, Summerfield, Browns Summit, McLeansville, Gibsonville, Burlington, Mebane, Graham, Pleasant Garden, Forest Oaks, Trinity, Thomasville, Asheboro, Denton, Silver Valley, Randalman, Lexington, Sophia, Midway, Advance, Clemmons, Rural Hall, Bethania, and Walkertown. The Gonstead concept of chiropractic begins with the body’s structural foundation and the intervertebral discs. Maximum balance and stability in the spinal column may be achieved when the pelvis, vertebrae, and legs are level. Foundational unleveling, intervertebral misalignments and motion disturbances, as well as nerve dysfunction, are primary considerations in Gonstead chiropractic health care and patient management. Injury to the intervertebral disc is of paramount importance in causing spinal subluxations, and therefore, Gonstead adjustments are designed for maximum affect to the discs, while also working to restore normal alignment and motion. Gonstead chiropractic assessment utilizes several methods of examination to analyze multiple factors, which, as effectively as possible, uncovers the primary characteristics of intervertebral disc lesions, intervertebral and full spine and pelvis alignment, as well as neurological ramifications of vertebral subluxation and full body health. This technique is the most commonly used of all chiropractic techniques and is the one probably most familiar to patients. The Diversified manipulation/adjustment entails a high velocity, low-amplitude thrust delivered by hand and possibly with assistance from a table or block. Developed originally by Dr. Clay. Thompson and fully patented in 1957, the Thompson Drop Table facilitates a full spine technique by the use of an adjusting table with a segmented drop system, which quickly lowers the section of the patient’s body corresponding with the spinal region being adjusted, whether in the thoracic, lumber or pelvic area. By means of this widely used device your practitioner thrusts at high speed, using minimal force, because while the thrust initiates movement, the fast drop carries the joint through the remainder of its range of motion. The Receptor-Tonus Method, is a type of soft tissue trigger point therapy. A Trigger point is a small localized muscle knot, that is usually tender and can refer pain to another location. Nimmo technique involves applying direct pressure on the trigger point(s) for variable amounts of time, usually a few seconds, allowing the muscle to relax and acquire its normal length and relaxation tone. The amount of force used is dependent on patient tolerance. Reducing trigger points in muscles allows the bone to which the muscle attaches to move normally to restore proper joint function. Additionally, trigger point therapy allows for restoration of normal muscle tone, flexibility and usually a decrease in overall pain in the area. Chiropractic is based on the scientific fact that your nervous system controls the function of every cell, tissue, organ, and system of your body. Your nervous system consists of your brain, spinal cord and millions of nerves. Your brain is protected by the skull, and your spinal cord by the 24 moving bones of your spine. Many everyday activities can cause these spinal bones to lose their normal position or motion, this is called a subluxation complex and can result in nervous system dysfunction and ultimately ill health. Bailey Chiropractic Centre uses a variety of chiropractic and rehabilitation techniques at our High Point, NC office. Common symptoms like headaches, neck pain, lower back pain, arm pain, leg pain, plantar fasciitis, tingling and numbness in the hands and feet, can be the result of spinal subluxations and can be corrected naturally with chiropractic care. Contact us today at our High Point, NC office for a free chiropractic consultation. Absolutely not! Chiropractic adjustments are 100% pain free. The entire Chiropractic adjustment usually last about 5-10 minutes, depending on your unique condition.